Looking for inspiration, I dug out a 1993 issue of a Quilters Newsletter magazine – remember when we used to get magazines in the mail?! I came across this diamond Bargello* design that was perfect for the fabrics I had already pulled from my stash. While the candy apple green was one of my ‘pieces of the past’ fabric (from Granny), the others were new. I had bought the cute multi-color zigzag fabric back around Easter time. I try not to buy holiday novelty prints that are too holiday-oriented, and thought the colors and zigzag had a fun vibe, and did not scream Easter. I figured with so many colors, it would be easy to use somewhere. So, off I go starting on this quilt. Uh-oh. I am building the rows and am about 90% done, and realize I am running out of the multi-color zigzag fabric. Ugh. There is no way the fabric store is going to have any of this fabric in October. Okay, don’t sweat it, move to Plan B. If you open the image in full screen mode, and look to the bottom left edge, you will see how I implemented my ‘Plan B’. This was donated to the County of Ventura, Children & Family Services, for a foster child in October 2017. 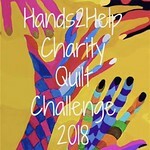 *I am not sure when the wave, and twist and turn trends got popular with Bargello quilts. In the 1993 magazine I referenced, the diamond design was referred to as an ‘advanced’ Bargello design. However, looking at all the variations of this quilt design out on the Internet, I am humbled in what I created here.